The beauty of nature offers refreshing moods to everyone. In Belitung Island, you can find many options of nature tourism. Waterfalls are always a good choice. If you look for a reference, there is Marsilla Waterfall. You can find it in Nyuruk Kampung Bentaian. The location is near to Ujung Gading Market. It involves trekking, as well. That means visitors should have a good stamina prior to exploring both the hill and waterfall. No worries. Your efforts are rewarding. That means you won’t regret it at all. Just because Marsilla Waterfall is small, doesn’t mean it is bad. The calm flow of the water and soothing nature will make your day. It doesn’t quite high either. You can even climb on those rocks. Have no fear, the terrain isn’t dangerous. As long as you wear proper footwear, your adventure is going to be smooth. Near to the waterfall, you can find dense plants. They create a comforting mood for visitors. If you want to swim, there is natural pond below the waterfall. The main lure of Marsilla Waterfall is the fresh water. The route to this waterfall is easy, so everyone won’t get any difficulties. There are two major falls in that location. First, it is located below the natural pond. The size is big and the water debt is high. Another waterfall is situated in a higher spot. The water flows like rain droplets. Though, it drops continuously. Both of them are beautiful! Thus, you must make sure to take some pictures of them. Even though the waterfall is easy to reach, you must carry a map. It helps you to explore nearby tourist spots, as well. A map can be a replacement for a tour guide. It is your primary navigation in reaching Marsilla. No worries. You can get the map from your tourist agency freely. For the best adventure, you need to hire a tour guide. It costs much money, though. Many local guides are ready to help. You can approach them in Nyuruk Kampung Bentaian. Since you are going to play water, you must carry extra clothes. When visiting the fall, make sure you wear thin clothes. Jeans aren’t recommended! Marsilla Waterfall features several stones, so you must wear proper footwear. Sandals with great grip are the best choice. If you are going to trek, you may need better sandals. These help you prevent injuries while exploring the waterfall. Another precaution is the facility. There are no food stands or mini markets. Due to this reason, you must carry refreshments. At least, you bring bottled water. 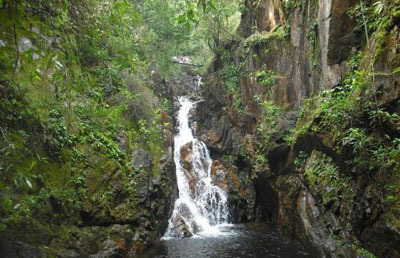 Marsilla Waterfall lies in Nyuruk Kampung Bentaian. That means you should head to Dendang District. From Tanjung Pandan, you can take Badau – Dendang Street. The trip takes approximately 50 minutes. It can be faster if you take a car. You should make sure to come in the morning. At that time, the water is cool and the nuance is perfect. During the trip, you can also enjoy the breezy wind.